Successfully Added inWatch Smart Watch - Bluetooth 4.0, 12 LED, Pedometer, Sleep Monitor, Support iOS + Android (Black) to your Shopping Cart. Stay healthy and fit with the stylish Bluetooth smart watch – inWatch. 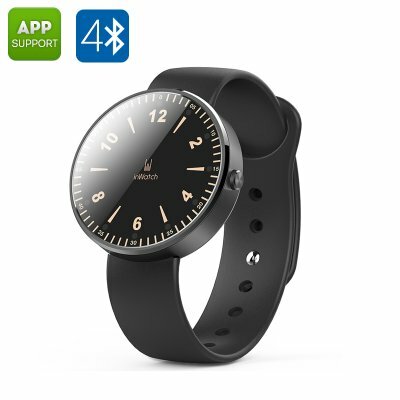 Coming with Bluetooth 4.0, a nice lightweight design and Android and iOS support, the smart watch is a great gadget for all those enjoying an active lifestyle. The inWatchsmartwatch is a handy little gadget that comes with a cool set of lifestyle features and will help you stay healthy and fit. The Bluetooth smartwatch comes with a pedometer – a great little inspiration for you to stay more active throughout the day and keep up with your fitness plan. When it’s time to head to bed, the smart watch will make sure you have a good night’s rest with the built-in sleep monitor. In case you get too immersed in your workouts, the watch comes will send you call and message notifications. Simply connect the smartwatch to your smartphone – it comes with both Android and iOS support – and look for the inHealthapp at the Play Store or App Store. The Bluetooth smartwatch comes with a simple classic design, a round watch face and 12 LEDs that will show you time, as well as alert you about incoming notifications. The watch can also double as an anti-loss token for your smartphone and will sent you a signal is your phone is too far. The inWatch Smart Watch comes with a 12 months warranty. Brought to you by the leader in electronic devices as well as wholesale Android Phones..